Delivering transformation in care and support for Scotland. 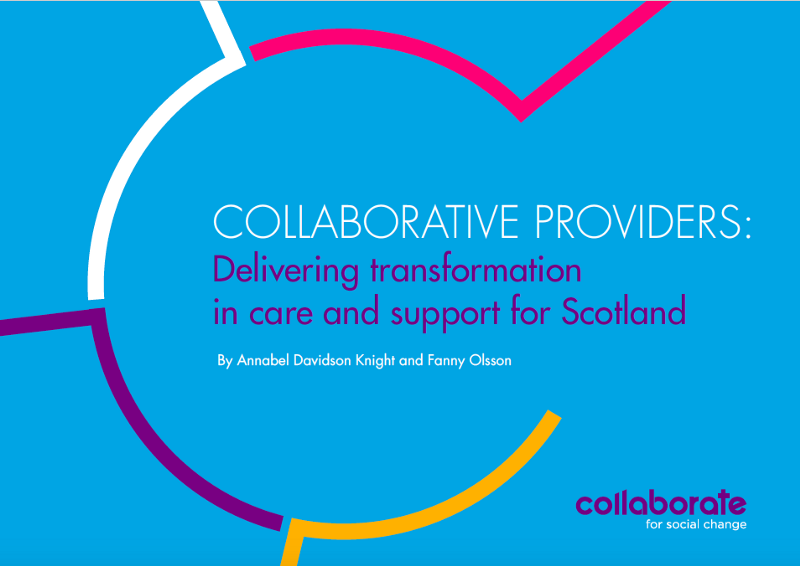 Collaborate recently launched a new joint report with the Coalition of Care and Support Providers (CCPS) in Scotland that explores the impact of collaboration within the Scottish social care market and offers a practical tool for organisations looking to turn collaborative ambition into action — the Collaborative Providers Index. The challenges facing social care are well-documented. Demand is increasing, resources are reducing and people are looking for more choice and control over the support they use to live their lives. The evidence from our research also shows that current systems, processes and relationships do not always encourage or enable organisations and people to do their best work. In our 2014 report with CCPS, From Providers to Partners, Collaborate found that meeting these challenges could only be done through working better together — harnessing the resources and innovation of the whole system. The report called on the sector to move away from competition towards collaboration. Changes to legislation and policy in Scotland have very much set the scene for collaborative relationships between commissioners, providers, supported people and communities, but the challenge remains — how do we actually do it? In this new report we present a story of third sector providers of social care collaborating to focus on person-centred care and support. We call these ‘Provider Collaborations’, and we present what we have learned about how these work; what difference they make; and the conditions required for them to flourish. This point is a great cause for celebration, offering an alternative way of organising resources and the sector’s strong professional and co-production skills to create better outcomes at a time when cuts are really starting to bite. But we also found these models were delivering on a range of key policy agendas in Scotland, including an increased focus on prevention, partnership working, place and person-centred support, as outlined in the Christie Commission. In this way they are testing many of the technical and cultural challenges facing Health and Social Care Partnerships across the country as they work through wholesale service transformation. Collaborate are continuing to work with our supporters in Scottish Government on a series of recommendations, which we hope can further strengthen the conditions for collaborative working in the care and support sector in Scotland and spread the impact to more people across the country. To learn more about this report and Collaborate’s work with CCPS in Scotland please contact Annabel Davidson-Knight. “The Scottish Government is committed to doing all we can to help those working in social services and healthcare, local organisations and communities work together to support people to live independently for as long as possible. This report details how vital this collaboration is and gives very helpful examples from across Scotland. It provides important information that everyone across care can learn from”. Sign up to Collaborate’s newsletter here. 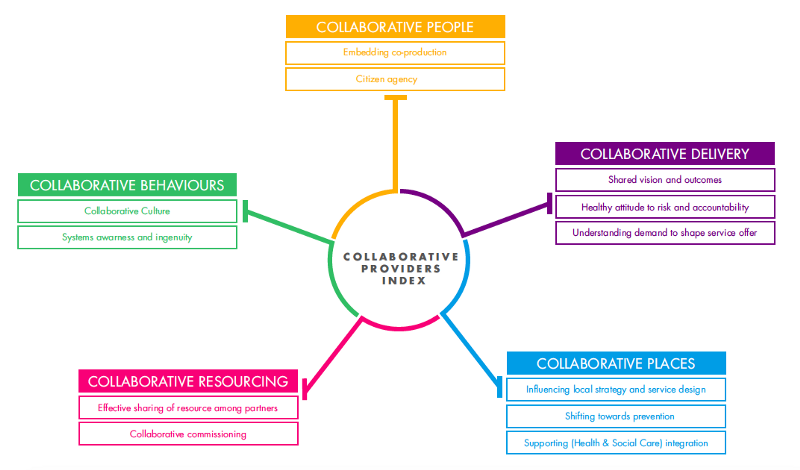 For some time now Collaborate has been an advocate of the place-based plan; a collaborative statement of intent across key organisations that draws on a range of insights, and sets out an ambitious, place-specific approach to improving outcomes. Last month, we facilitated a two-day collaborative leadership convention for 280 staff and board members from the 43 Active Partnerships across England, plus wider partners. Blog posted by: Collaborate CIC, 10 April 2019. Yesterday Collaborate CIC and Newcastle Business School (of Northumbria University) are excited to publish our new research into funding, commissioning and delivering in complex environments, supported by the National Lottery Community Fund and Tudor Trust. Blog posted by: Collaborate CIC, 13 February 2019. Since 2017 Collaborate has been working closely with partners in Tower Hamlets to develop a place-based borough plan and support a new Strategic Partnership Group. At the end of last year, the Collaborate team spent a day reflecting on what we are learning from our work and made a collective resolution for 2019: to be bold about the future we want to create. As another challenging year for the UK and beyond draws to a close, the Collaborate team have spent some time together looking back over the past 12 months, exploring what we are learning from our work with places and organisations from across different sectors. Last month, Collaborate supported large-scale cross-sector events focussing on health and care priorities in the London Boroughs of Croydon and Sutton. Below are our reflections on the value of these types of events and some critical considerations on design, delivery and follow-up.